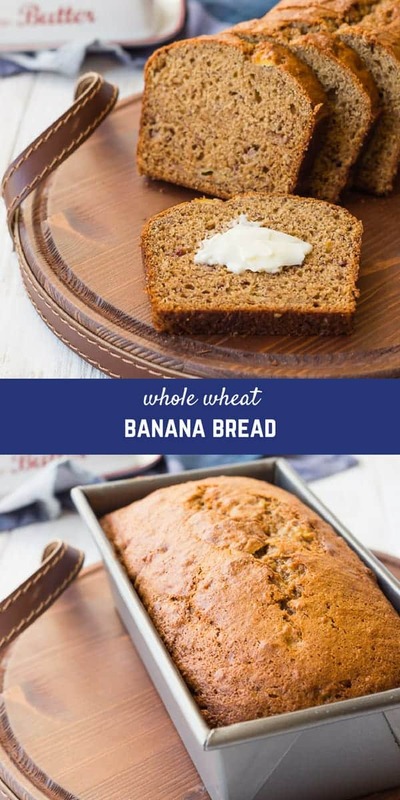 Whole Wheat Banana Bread is a staple in my house – my kids adore it and it’s the perfect use for ripe bananas. People are always shocked when I tell them this is healthy! It freezes well and it’s going to become a staple in your house, too. When I realized I hadn’t posted this recipe, I knew I had to get on it, right away! It’s one of my favorites and one that I make so frequently. I even let my type-A personality take the backseat sometimes and let my kids help me out with this one. They love using the potato masher to mash the bananas. They also love talking me into adding some chocolate chips. 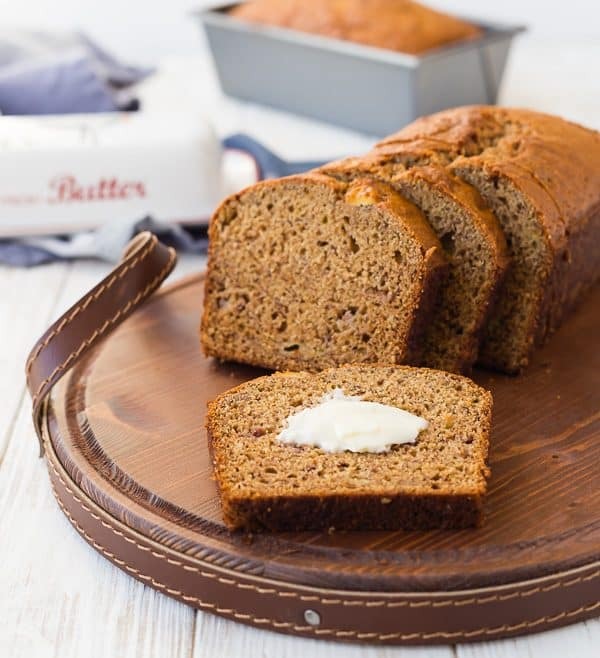 I’ve shared a few varieties of this bread – chocolate banana bread, whole wheat caramel banana bread, whole wheat banana bread with chocolate chips and coconut, reduced-fat chocolate banana bread, and skinny banana bread muffins! 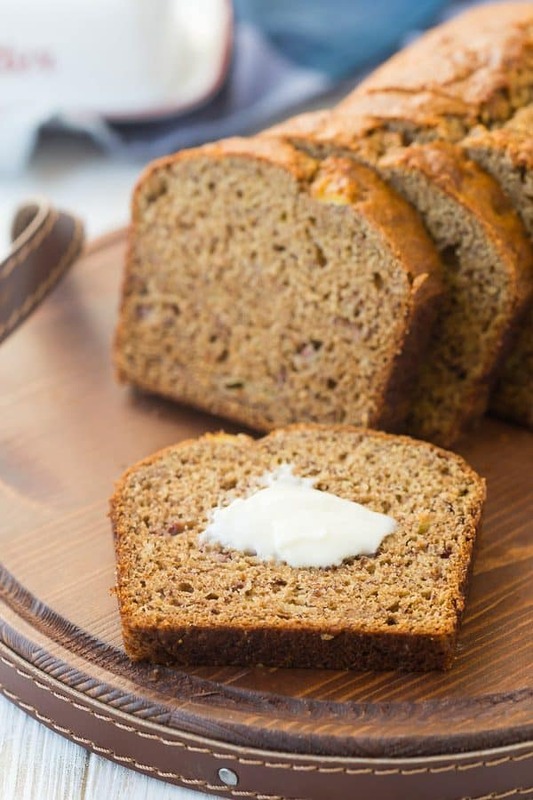 We really do love this whole wheat banana bread in every shape and form. Even with all its different variations, this version is the one I go to most often. If I have enough bananas, I almost always make two loaves. I’m all about doubling up on things because it isn’t too much more work to use a bigger bowl and wash two loaf pans, and then I have a loaf to freeze. 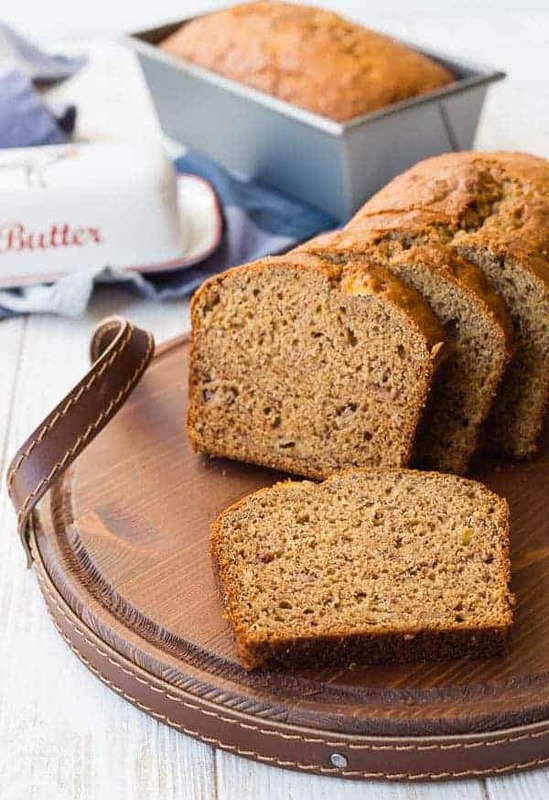 This banana bread freezes super well – you can freeze it whole or you can freeze it cut up into slices so you can easily grab one and go. When I first began making this banana bread, I’d always use three bowls. One bowl for mashing the bananas, one for the wet ingredients, and one final bowl for the dry ingredients. It’s the type-A in me again, probably. Then I remembered that I don’t like doing dishes, so I switched to the method I use now. It uses one bowl…usually my big giant stainless steel bowl that is typically reserved for holding my precious popcorn. I start off by mashing the bananas in the bottom of the bowl. To the bananas, I add the rest of the wet ingredients. On top of them, I gently add the dry ingredients. I’ll give those a little toss together before stirring them into the wet ingredients. I’ll let you in on a secret – it turns out the exact same way! And it’s a third of the dishes. It’s a beautiful thing, right? 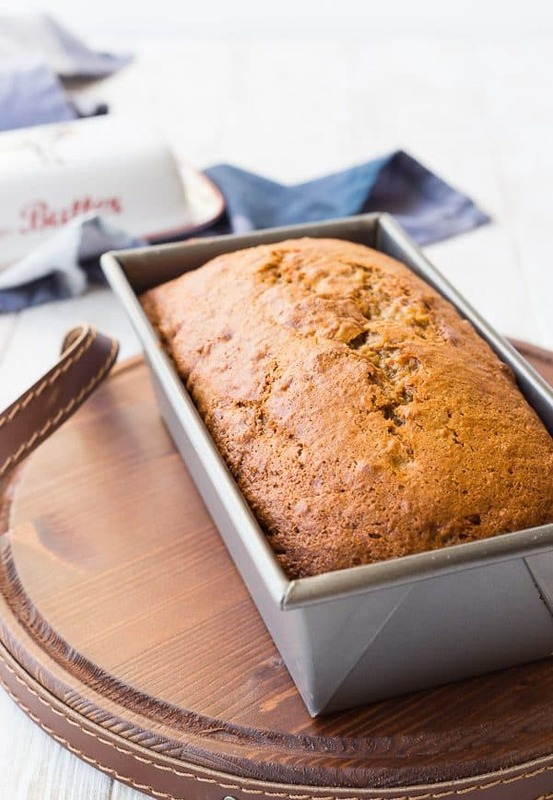 I know you guys are going to absolutely love this banana bread as much as we do – make sure to watch the video at the top of this post, too! 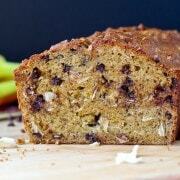 Enjoy this whole wheat banana bread today! 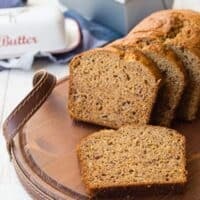 Whole Wheat Banana Bread is a staple in my house - my kids adore it and it's the perfect use for ripe bananas. People are always shocked when I tell them this is healthy! It freezes well and it's going to become a staple in your house, too. Place mashed bananas in a large bowl (I'd mash them right in this bowl to save dishes!). Add eggs, sugar, applesauce, oil, and vanilla. Whisk to combine wet ingredients. On top of wet ingredients, add whole wheat flour, baking soda, baking powder, and salt. Gently mix the dry ingredients together before stirring into the wet ingredients. Whisk all ingredients together just until combined. Spray a 8- or 9-inch loaf pan with nonstick cooking spray. Add banana bread batter and smooth out into an even layer. Bake for 55-60 minutes or until a toothpick or knife inserted in the center comes out clean or with a few crumbs. Cool for 10-15 minutes in the pan before turning out of the pan onto a cooling rack. Cool completely before slicing. Verdict: I love this banana bread warm with some butter smeared on it. What’s better than that? Husband’s take: No one in my house complains when there is a loaf of banana bread available. Everyone loves it! I always make a loaf when I’m going to be out of town so they can eat it while I’m gone. Changes I would make: None are necessary but if you want to have some fun with it, chocolate chips are never a bad idea! You could also try some of the variations I mentioned above. Could I possibly use 2 tbsp of melted butter and plain yogurt instead? So excited to try this. I’m assuming you mean plain yogurt instead of the applesauce? And butter instead of coconut oil? I haven’t tested it that way, but I imagine it should work. I followed the recipe as it is and made my own applesauce, and it turned out delicious! Thanks! I’m so glad to hear that! Thank you for taking the time to come back and leave a comment! 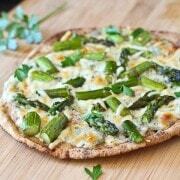 Absolutely delicious, I’ve tried several whole wheat bread recipes yours’ is the best. Wow, thank you so much! I’m so happy that you like it! Thank you so much for taking the time to come and leave a comment – it means so much to me! I was looking for a banana bread recipe using wheat flour. I followed the recipe as written. It is delicious! I have found a keeper. So glad you liked this recipe, Theresa! We just made a batch on Saturday but my kids talked me into adding chocolate chips. This is one of my most-used recipes in my own home and I’m so glad you’re enjoying it too! Thanks for taking the time to come back and leave a comment! I cut the sugar to 1/2 C. brown sugar, and added 1/2 C. walnuts and 1/2 C. chocolate chips. It’s delicious. Thanks for the recipe! I’ll try the version with coconut next. One note on timing: Usually my oven takes a few minutes longer than a recipe states, but for this recipe, it needed a few minutes less. At 57 minutes, I could smell it really needed to come out and took it out of the pan immediately. Next time I’ll take it out at 50 min and let it cook in the pan IAW recipe. Loving the addition of walnuts! It could be your loaf browned faster due to the brown sugar? But I’m glad it worked out! Thanks for taking the time to leave a comment! Can honey be used as a substitute for sugar? I haven’t tested this recipe that way, but I bet it would work great! Can I substitute fresh pineapple puree for the applesauce. Cos I don’t have applesauce. Or is there a way to make applesauce at home? You can make applesauce at home by cooking peeled and cored apples on the stove until they are soft, adding water as needed to get the right consistency. Pineapple puree will drastically change the flavor of this recipe…but it might be tasty nonetheless. Let me know what you end up trying! don’t have any apple sauce. Oh no! So sorry to hear that. 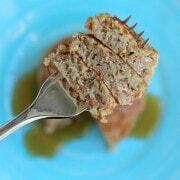 Try my applesauce bread!